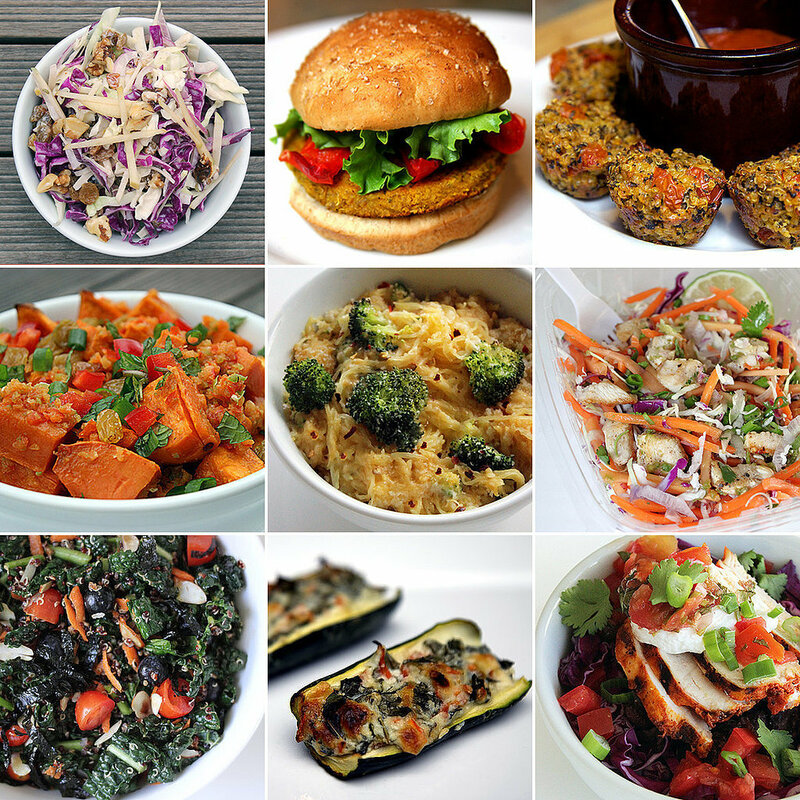 If you spend hours scouring Pinterest for the most delicious healthy recipes out there, it’s time to spend some time checking out the following delicious dinners — all 25 of these healthy meals have each been pinned thousands of times! Whether you follow a gluten-free, vegan, or Paleo lifestyle, there are a number of dishes here that deserve a home on your healthy-recipe board. 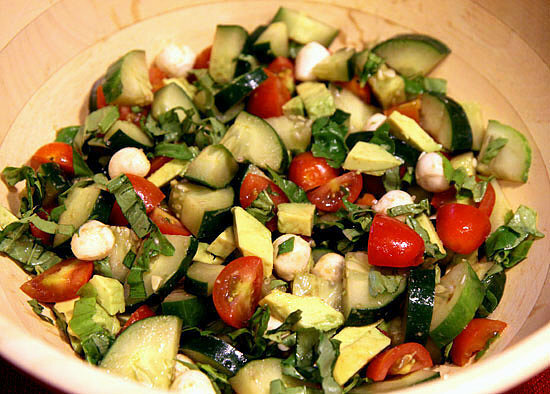 For a detox salad that satisfies, you need to try this Candice Kumai recipe. 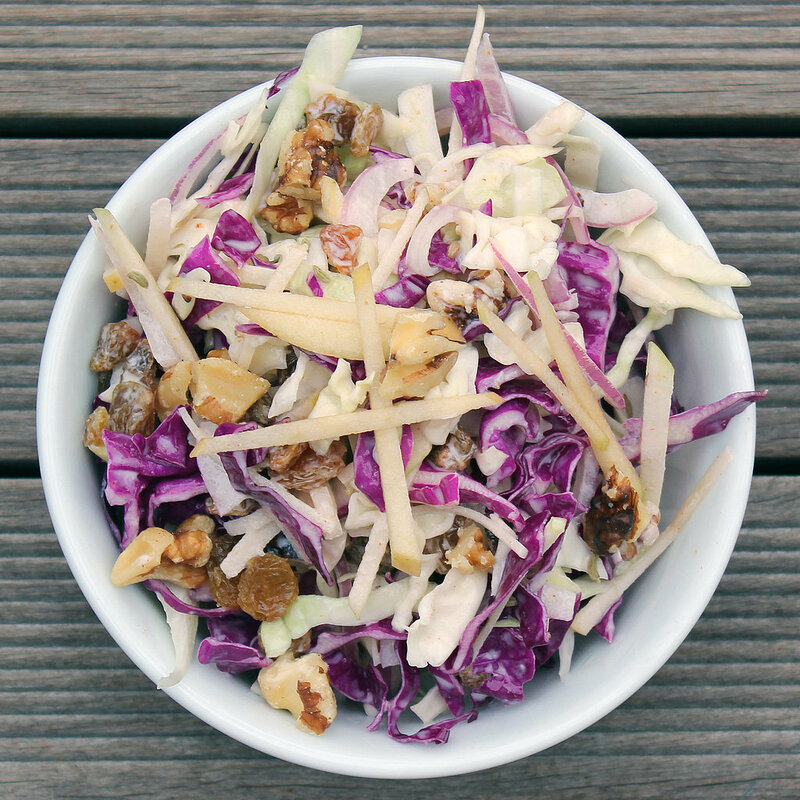 Apples marry with the dynamic duo of red and Savoy cabbage, combining for a fiber-filled meal that aids in digestion. 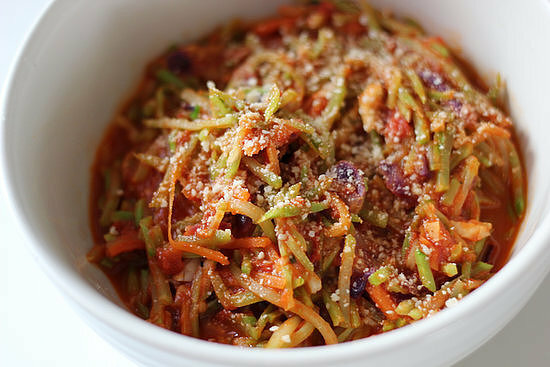 The addition of fennel seeds adds to the fiber factor, plus a kick of cayenne boosts your metabolism. Feel free to serve with a grilled chicken breast or turkey slices to round out this meal. 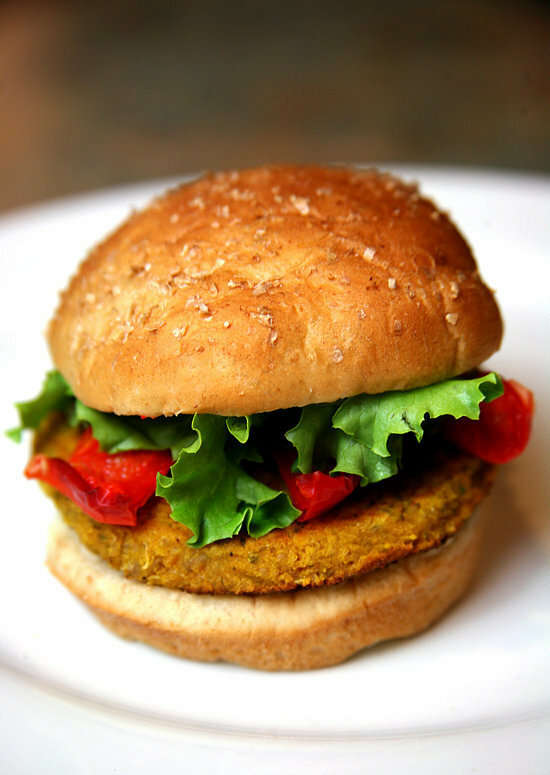 A riff on a traditional veggie burger, this bean-and-grain-based spicy chickpea, barley, and quinoa burger offers over 16 grams of protein. This recipe is easy to prepare: just make sure you have all these grains cooked in advance. 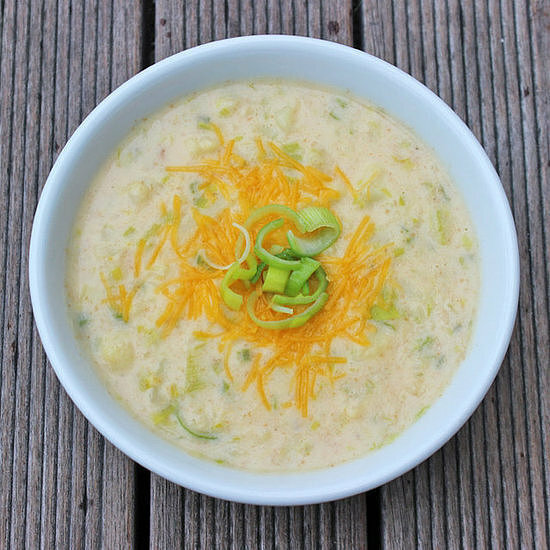 For a lighter twist on this favorite, try our simple-to-make cheddar-cauliflower soup. It’s easy to throw together on a weeknight, and even better as healthy leftovers for lunch the next day. 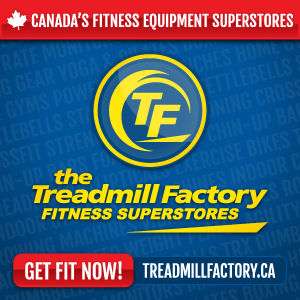 Cut all the long lines — and more than half the calories! 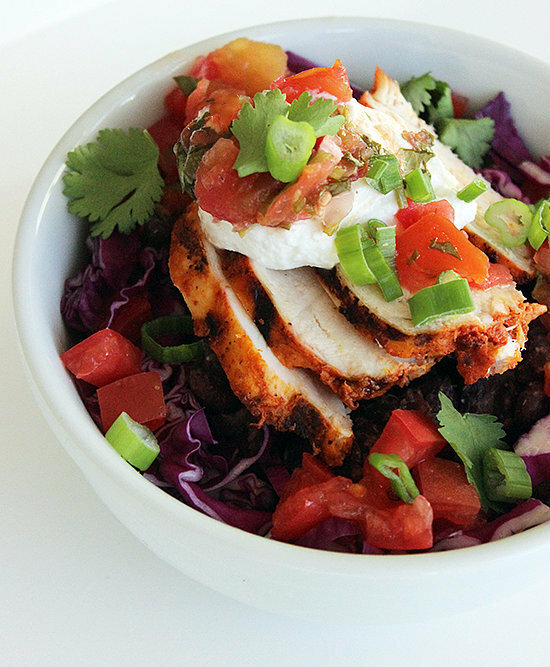 — with this quick and delicious burrito bowl you can make at home in less than 10 minutes. A precooked chicken breast, fresh produce, and a few healthy staples are all you need for this nutrient-dense, low-calorie meal. If you can’t have gluten, you can still enjoy this cheesy, pasta-inspired spaghetti squash bakethat’s full of fresh veggies. You’ll never even realize it’s gluten-free. 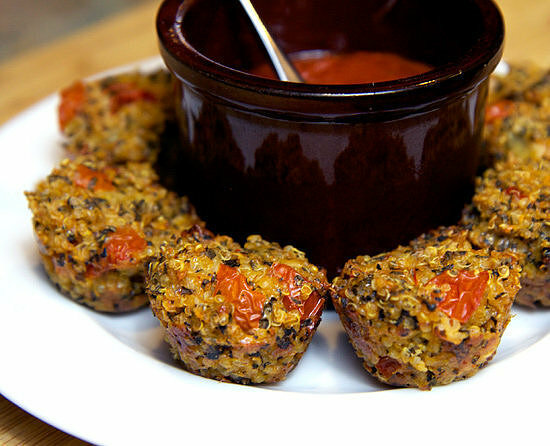 If you’re craving pizza, opt for these quinoa pizza bites instead. This nutritious treat features the goodness of the whole grain packed with fiber and protein with the flavors of your favorite Italian dish. They’re a great snack or special party appetizer, but a plate of these can make great dinner instead of dialing in takeout. This cheesy, garlicky “pasta” from healthy chef Hungry Girl is the best of both worlds — it’s just as fast to make as any simple pasta dish and doesn’t come overloaded with carbs. Bulk up your standard caprese salad with this tasty and refreshing salad recipe that adds hydrating cucumber and omega-3-rich avocado to the mix. 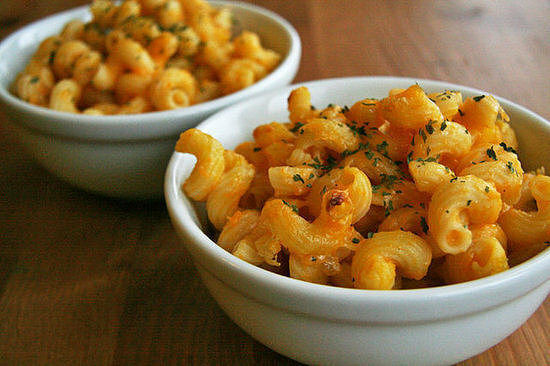 Is there anything more comforting than macaroni and cheese? 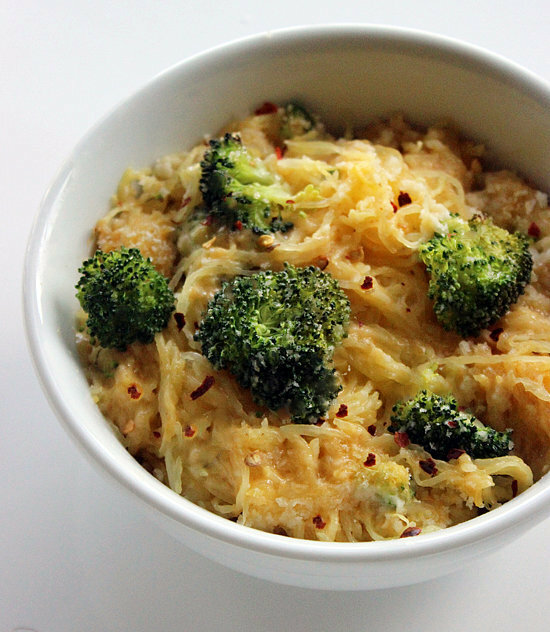 If you’re looking to lighten things up the next time you dig into this indulgent dish, opt for this twist on tradition that amps up the nutritional value as it cuts back on calories and carbs: spaghetti squash mac. Zucchini and fresh basil are Summer produce staples, so here’s a delicious recipe that pairs the two. 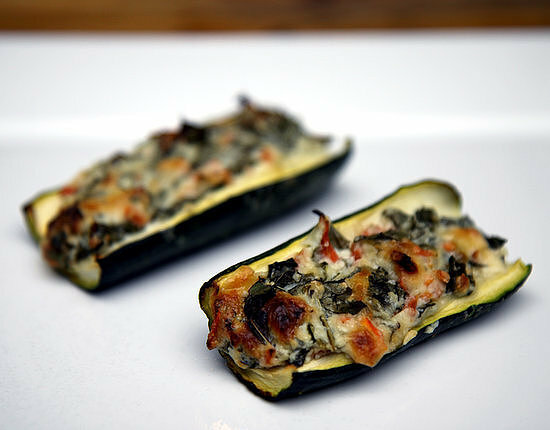 A plate of these zucchini boats is savory, warm, soft, and delicious and reminiscent of a cheesy pizza pie. 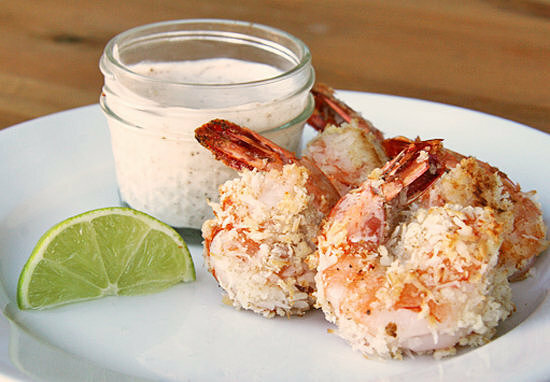 If your taste buds are craving a quick trip to the tropics, this baked coconut shrimp will get rave reviews. Typically served with a sweet and spicy Asian sauce, this version is paired with something a little creamier and with less sugar. If you’re cutting back on gluten and grains, this veggie-powered pizza needs to make its way to your kitchen. 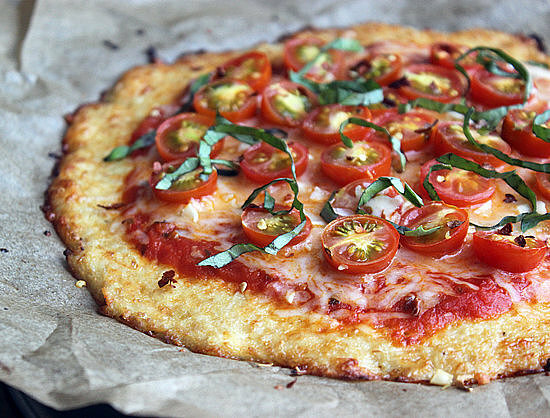 Freshly grated cauliflower serves as the base for the creative and delicious crust that you can fold up just like traditional pizza. High in protein but low in calories, shrimp is a healthful option for a seafood-loving bunch. 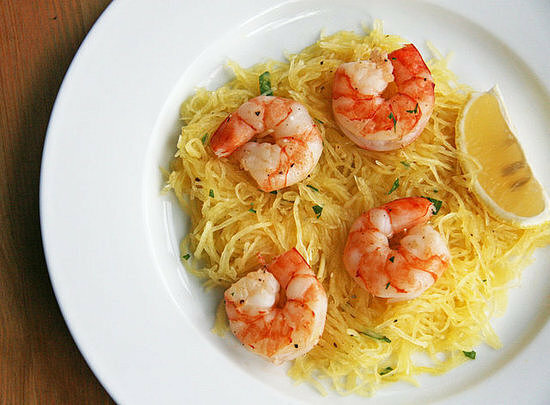 This play on shrimp scampi takes the gluten and pasta out of the equation and offers a tasty vegetable in its place: the spaghetti squash. 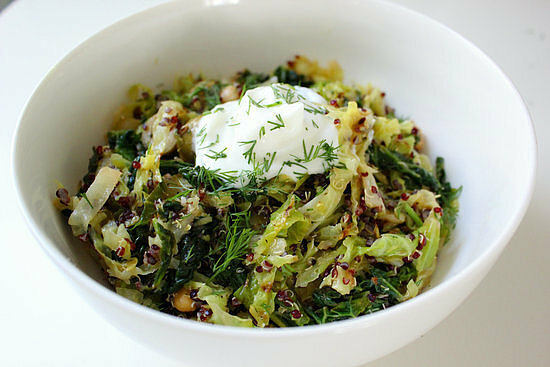 This lemony toasted quinoa and wilted cabbage salad is the perfect recipe for any clean-eating endeavors; not only do the flavors meld well together, but each ingredient helps aid digestion, like the fiber in the quinoa, chickpeas, and cabbage and the detoxifying properties of lemon. Sub in nonfat Greek yogurt to keep the same texture and tang you love, but cut the calories and fat of the traditional in half. 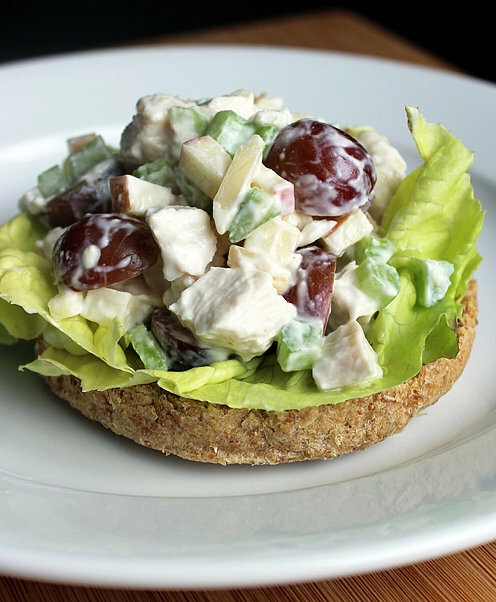 Serve your healthy chicken salad over a bed of lettuce, tucked in a pita pocket, or on top of a toasted English muffin for a light yet satisfying dinner. 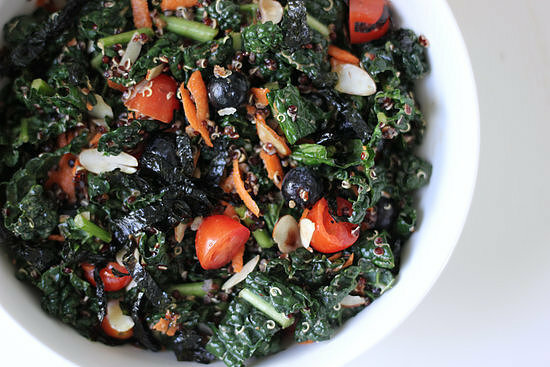 This kale and quinoa salad gets an Asian twist with sesame soy ginger dressing and sliced nori. Blueberries, tomatoes, and carrots add a bit of sweetness, while sliced almonds give it a satisfying crunch. 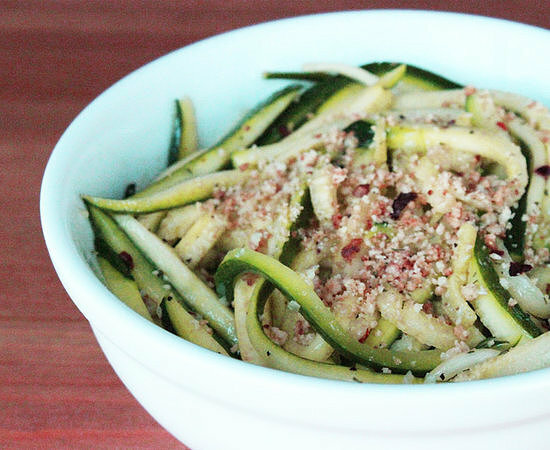 When you’re craving a big bowl of garlicky pasta, cook up these zucchini noodles aglio et olio (garlic and oil) instead. 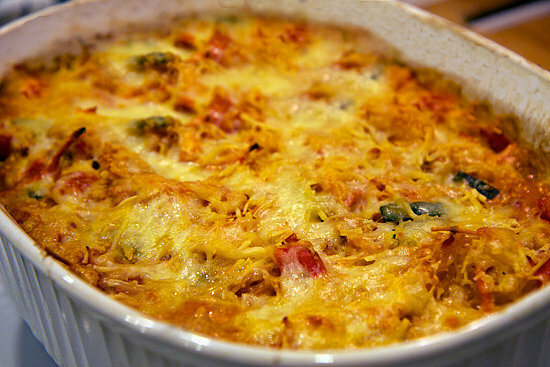 The real comfort here, other than that fragrant garlic, comes from “breadcrumbs” created from toasted almond meal. The unexpected addition of pureed squash to mac and cheese recipe may raise a few eyebrows, but not only does the puree help the recipe keep the nostalgic orange hue (without any food coloring! ), but also the taste remains traditional. This version of Trader Joe’s citrus chicken salad tastes better than the original and is just as low in calories. 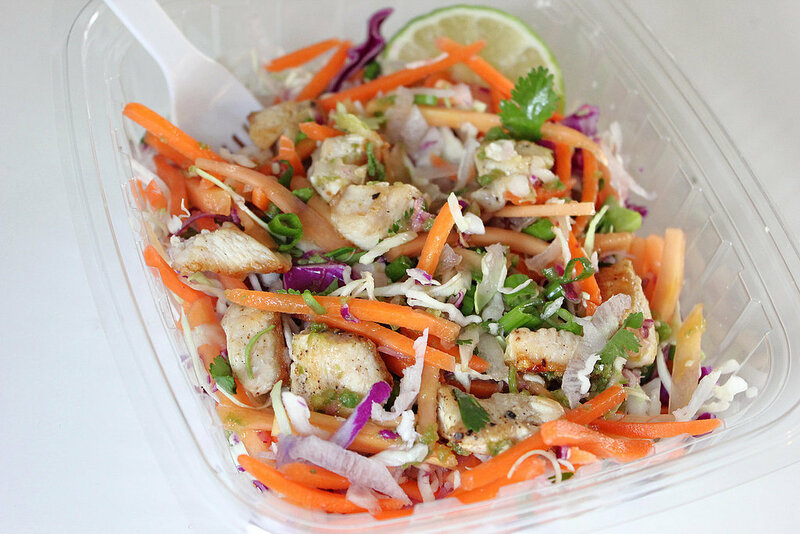 A mix of digestion-relieving cabbage and papaya and hydrating, antioxidant-rich daikon — along with a tangy Thai-inspired citrus dressing — makes for a flavorful, filling lunch that’s high in protein and low in fat and calories. 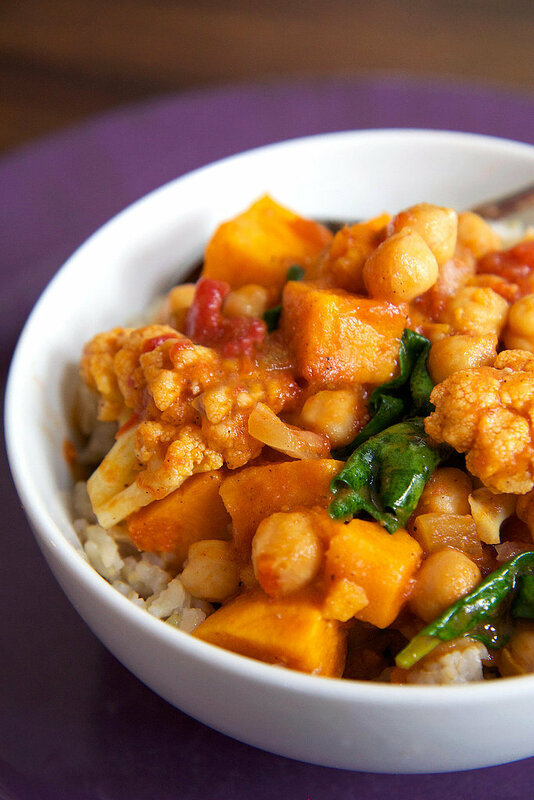 After one bite of this chickpea and sweet potato curry with coconut rice, you will be sold. Each serving is about 400 calories, and because this recipe serves six, you can impress your friends with this bold yet easy-to-make dish or save the rest for tomorrow’s lunch. It’s possible to warm up with a creamy bowl of hot soup that doesn’t lay on the cream or calories too heavily. 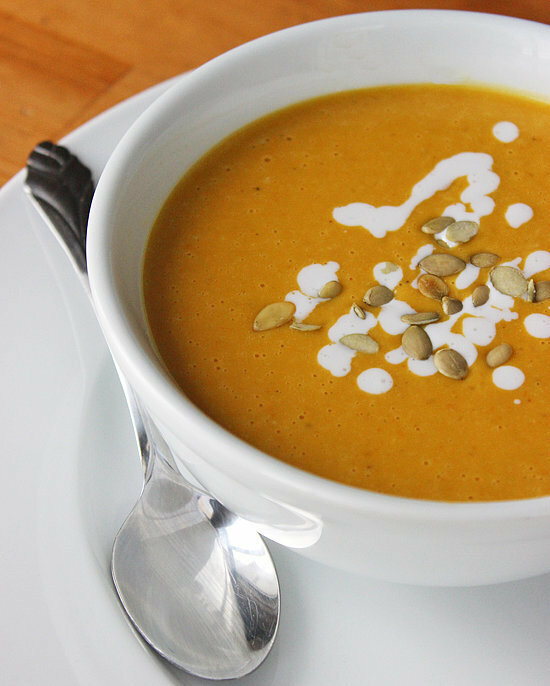 This light pumpkin-coconut bisque will curb your dairy cravings and keep you on track. 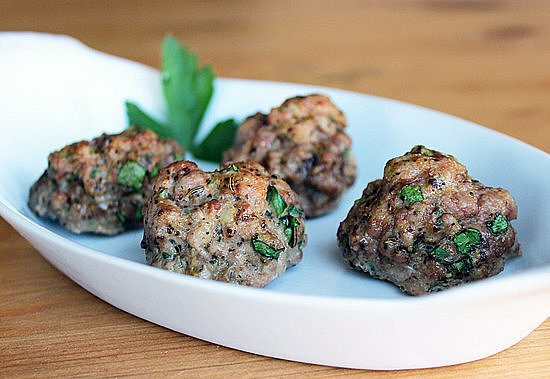 A creative blend of traditional Czech spices and fresh herbs give these nutritious, protein-packed Paleo pork meatballs their delicious flavor, while just one egg and a little mustard acts as the binder that holds these balls together. 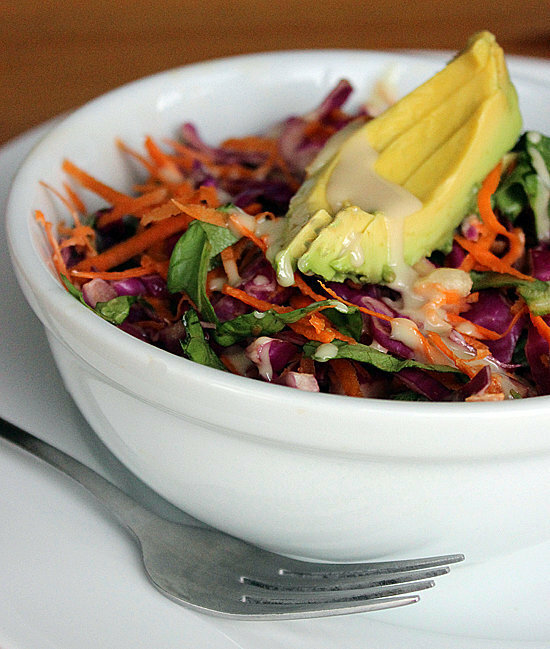 High in fiber, vitamin C, and vitamin A, this raw rainbow salad will add some color and flavor to a day of detox. The water content in romaine works to hydrate your body while the high fiber content in the red cabbage and carrots aid in healthy digestion. 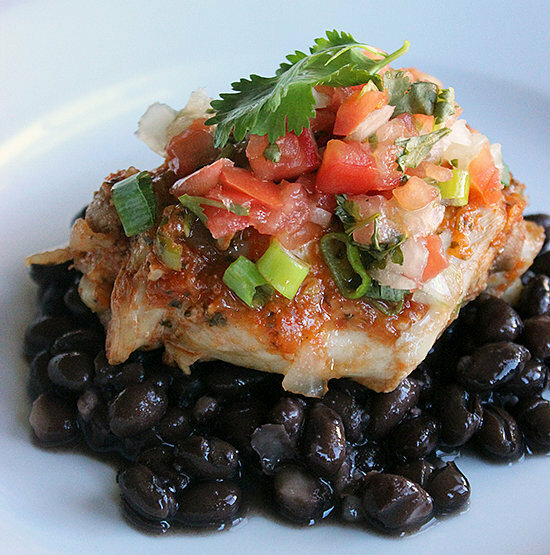 For a healthy, protein-rich meal that doesn’t rely on dairy for flavor, try this deliciousMexican-style chicken recipe full of fresh ingredients. Make sure to leave 15 minutes for the first two steps, then pour everything into your slow cooker, and let it do its magic. 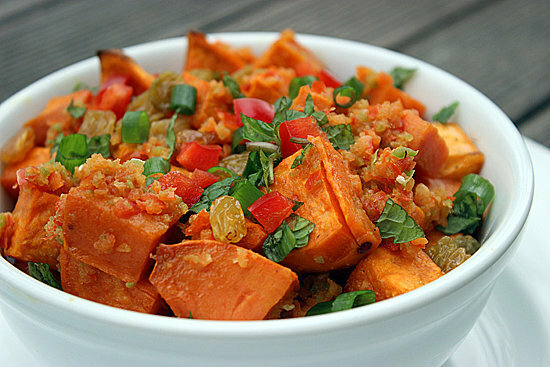 High-fiber sweet potatoes can regulate blood sugar and help you lose weight, while a antioxidant-rich red pepper and jalapeño dressing ties everything in this spicy recipetogether beautifully. Be prepared to leave a lunch-sized portion aside, since this easily portable salad is even more delicious the next day.